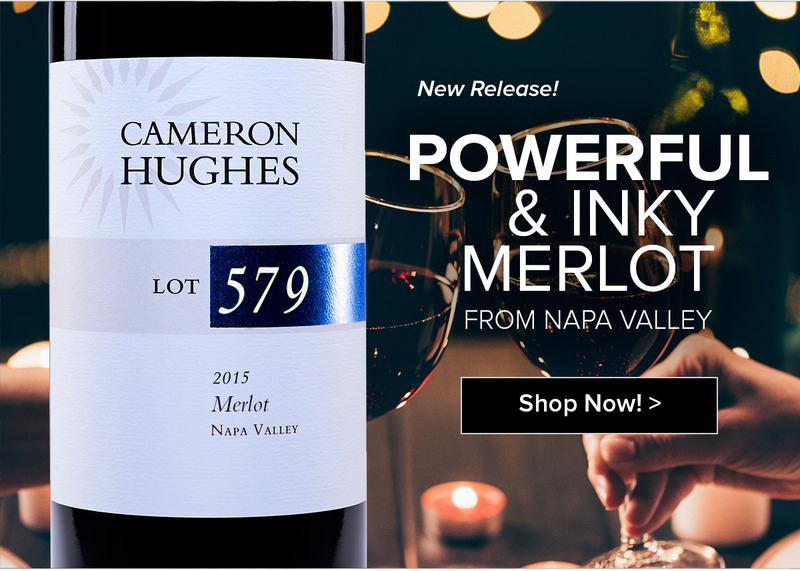 Just Released: Powerful, Inky Napa Valley Merlot! Following on from our Lot 578 Cab Franc release (already sold out, I hope you got yours in time! ), today we are bringing you the next release from the same winery: Lot 579 2015 Napa Valley Merlot. 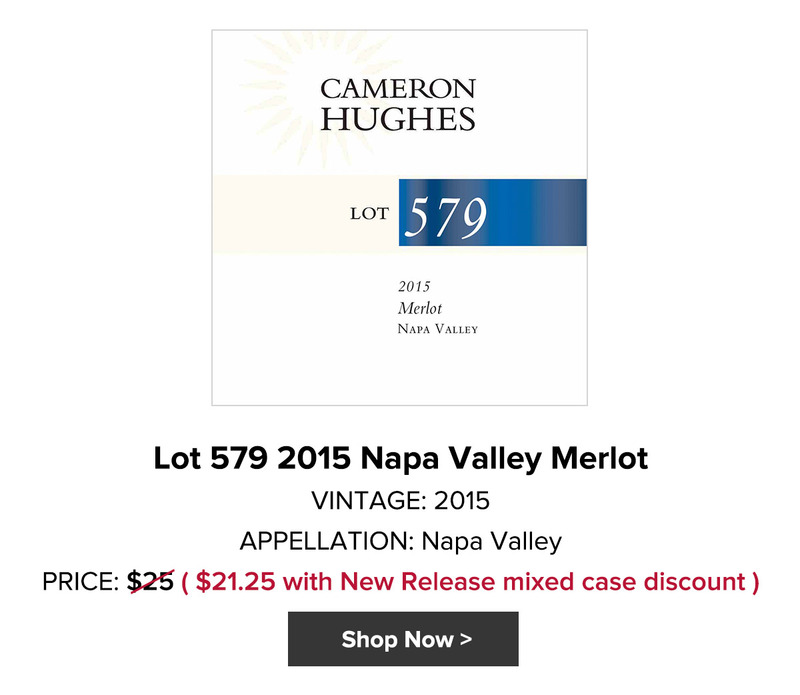 As with Lot 578, today’s offering was made available to me due to the winery changing hands and new ownership’s need to reposition the inventories on hand. Sourced from a $125+/bottle program, this is one of the most expensive Merlots in Napa Valley and has a reputation as being one of the best Merlot plantings in the Valley – we’re lucky to have been first in line to gratefully receive the bounty of the brand’s “transition”. Again, the vineyard is located just between the base of the Atlas Peak appellation and the Silverado Trail at the cooler, southern end of Napa Valley – an ideal site for Merlot grapes. Lot 579 is a “Cab drinker’s Merlot” whose structural quality is on full display here, with an intensely powerful, rich, and chewy nature. Just fantastic, and it gives me great pride to get a wine of this pedigree into your hands at such an amazing price. For those of you that still have reservations about Merlot due to forgettable experiences with cheap commercial offerings (or because of a certain movie about two buddies driving through wine country), let's dispel the misconception once and for all - Merlot is one of the world's premier grapes, commands the highest respect in the wine world, and deserves just as much acclaim as Cabernet and Pinot. Opaque in the glass, this deeply colored red is rounded out with 3% Cabernet Franc and 2% Petit Verdot. The nose is a bit concave and brooding at this point, drawing you down into the complex and swirling but also fleeting and ever-changing aromas – the olfactory effect of “structure”. Think Pomerol on steroids. Loamy olive and crushed red rock are replaced by black cherry juice and deep plum, which give way to acacia flower, cedar and blackcurrant…all of which are constantly shifting and ethereal. Supple on entry, but you’ll quickly get the impression of power as the chalky, well-integrated tannins rise up to greet you. Perfectly polished and quite pleasurable for a wine of this immensity, the subtle waves of fruit riding the broad tannic frame quickly serve to remind you that this wine is just a baby. Definitely decant for a few hours, or give it a cool, dark home to rest and drink over the next 10 years. As a New Release special offer, go ahead and take 15% off any purchase of one case or more through Sunday night at midnight (Wine Club members get 20% off) as long as the order includes one bottle of Lot 579 (mix and match the whole store! ).